Usually when the kids arrive home after being away, we enjoy a brief honeymoon period: they are engaged, chatty, appreciative, helpful and pleasant. Not this time. My 16-year-old daughter returned yesterday after four weeks of being a junior counselor at a YMCA girls’ sleepaway camp–the very one I attended as a child 35 years ago–and she clearly was not happy to be home. She was unusually distant and short with us, though she was reasonably cheerful with her brother and sister. I was surprised by how much her remoteness bothered me. Certainly it was out of character; usually she is open, sweet and communicative. Even when I tried to engage her by asking questions, she shut down. I asked her if she was irritated at me and she said, in an irritated voice, “Why would I be irritated at you?” Because I represent home and authority? Because I am not your camp friends? 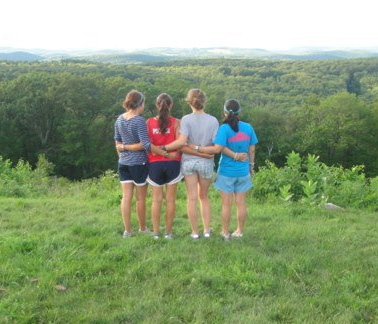 Because I still think of Camp Mohawk partly as “mine” and you think it’s entirely “yours”? Then I asked her if she was still in the “camp zone” and she said “Yes” before retreating to her room to turn up the music a little louder. I distinctly remember the letdown of coming home after four liberating weeks at camp or–even more acutely–after a semester of college, feeling hemmed in by my parents’ rules, the thin walls of our house, the return to family routines and responsibilities. It should have made me sympathetic to my daughter’s homecoming experience, but it didn’t. Instead, I felt how I imagine my mother used to feel: unappreciated, extraneous, disconnected, annoyed. I realized, watching “The Wizard of Oz” later that evening with my 9 year-old, that it’s all part of my displacement as the great and powerful wizard. She’s pulling back the curtain, not necessarily because of anything I did, but because she’s ready to. Being away from home makes you see your family in a stark, new light, and while that can make you appreciate them more, it also highlights their limitations–and your own strengths. I have begun to notice my competence outstripped by that of my teenagers in several ways, mostly involving technology. But even when my 13-year-old son and I hiked Mt. Washington a few weeks ago, I was surprised by how abruptly we had shifted roles: instead of my waiting for him and urging him on, as I would have done a few short years ago, he was the one waiting for me at every fork in the path and offering me his hiking poles when the rocks got slippery. I have heard people say that the worst summer they ever had with their teenager was right before he or she left for college. This makes evolutionary sense to me: fighting over everything from curfews to laundry to car privileges is nature’s way of preparing both parent and child for the separation. I guess we’re just getting a head start. This entry was posted in Family life, Kids, Parenting, Reality check, Teenagers and tagged leaving the kids, Mt. Washington, separation, sleepaway camp, Wizard of Oz. Bookmark the permalink. It would be better if kids could “grieve” their summer in a hiatus, somewhere between camp and home. But of course, they have to do it under our watchful eyes in the semi-privacy of their own bedrooms. But when their other friends begin returning home and they find routine with their siblings once again, they are finally home, as we remembered them. I spent part of last night helping Max make a photo album of his “summer of a lifetime” in Europe and Israel. He showed me his captions, some of which were inside jokes among his mob, and the amazing place he had been. Though it was truly his experience alone, and it was over several weeks ago, he will let it percolate through to the rest of us in little ways and with that, our family will seem a little bigger. Sue, you always capture the universal experiences of parenthood in ways that make it possible to laugh at them and enjoy them for what they are (even if they’re sometimes painful). I know just what you mean about shifting roles. When the kids learn to drive we become, for all practical purposes, superfluous – and they’re so quick to point out when we make a mistake or break the rules they learned in driver’s ed! Relatable piece, Sue. I should bite my tongue for saying this, but I’m grateful kids today have Facebook to stay in touch with camp friends and help ease the transition home. An old friend (who I met one summer long ago) mentioned this blog entry and so I looked – couldn’t believe it when I saw that your camp was Mohawk!! Mine, too. I’ve never ‘met’ another adult who went there. I loved it so much. I wish I had a daughter, if only so that she could go there too (and I could visit!) I totally remember that in between camp and home feeling. You capture it well. Laura, thanks so much for responding; what years were you there?